I cannot thank my parents enough for choosing to stay back in Aurangabad instead of moving to a “bigger” town. I had a privilege to grow up with people from diverse backgrounds. Some of my closest childhood friends are Maharastrian, Marwari, Sikh, Christian and Islamic. Due to lack of things to do in Aurangabad, we ended up spending lot of time at each other’s houses. In the process we ended up learning and enthusiastically participating in their festivals and rituals. Any one who knows me knows that I love anything old, vintage and that belongs to my either of my moms or grandmother. This vibrant Banarsi Silk Saree is one of a kind heirloom piece. It belonged to my mother in-law’s mother in-law. Baa wore this saree on my in-laws wedding reception 36 years ago. My mother in-law has huge saree collection that I am always eyeing J. I was in love with this saree the day I saw it. And did not hesitate for a second when she asked if I wanted it. 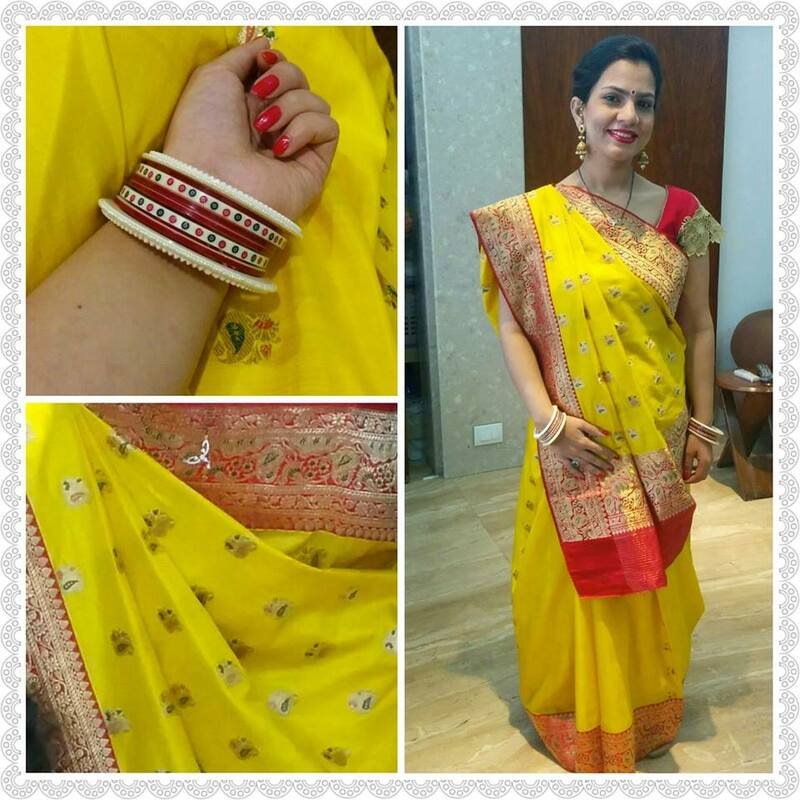 The saree is a beautiful yellow color silk with vibrant red real zari border. Even after so many years the saree is intact. It has a few stains right in the front, but for me that’s what adds to charm of the saree. According to mom this saree was purchased from Banaras for Rs. 300. I am often teased about not embracing my Gujarati culture. So, this Ganesh Chaturthi I decided to wear this vintage saree Gujarati Style. 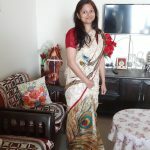 I am ashamed to admit but I have spent money in parlors to drape saree. But I was not willing to spend Rs. 1000 (FYI everything is expensive in Mumbai). So, I watched a million YouTube videos and learnt it my self. It is easier than I thought. The saree stayed in place for over 12 hours J. Wore it with my wedding chudda given by my Nani and traditional Guajarati ivory bangles given by my in-laws. Saree #2 is dedicated to my husband who was very close to his Ba and misses her deeply. The look on his face when he saw me in his Ba’s saree was priceless. Thank you Harsh for doing this for me and participating at every step from start to finish. This festival is more than about the rituals for us, it is about creating memories for us and with our niece and nephew. He wants her to talk fondly to her friends about how she spent Ganpati picking up the Idol, going to Chowpatty beach for virsarjan and everything in between. It’s about forgetting everything that has been going on in our lives for two days.